Steinaker State Park staff and guests enjoy a star party in the park. Photo by Bettymaya Foott. Steinaker State Park in Utah, U.S., today received its new status as an International Dark Sky Park. It is the fourth Utah state park to receive IDA accreditation, joining Antelope Island, Goblin Valley, and Dead Horse Point state parks. Utah leads the U.S. states in International Dark Sky Places designations, with nine International Dark Sky Parks and one International Dark Sky Community. Located 11 km (7 miles) north of the city of Vernal in Uintah County, Utah, U.S., the Park highlights a manmade lake fed by Ashley Creek behind Steinaker Dam, a 609-meter (1,997-foot) long earth fill dam completed in 1962. Well-known to naturalists and fossil hunters, the area brims with a large diversity of plant and animal species. Steinaker’s location makes it a popular base for exploring both Dinosaur National Monument to the east and the Flaming Gorge National Recreation Area to the north. In order to earn International Dark Sky Park status, Steinaker State Park staff took measurements of the quality of their night sky over the course of a year and a half; held fun, educational night sky events; and changed their bulbs and fixtures to enhance views of the stars. They also kept the public informed of their progress through presentations at public meetings, features in traditional and social media, and installing informational panels. An event to celebrate the designation will be hosted at the park in spring 2018. Utah State Parks Director Fred Hayes is excited so many parks in the state parks system are enhancing their spectacular night skies because it falls in line with his “more people having more fun in more parks more often” philosophy. Visitors from across the country and around the world routinely tell Utah State Parks staff they have specifically come to their parks to get a glimpse of the Milky Way or other celestial wonders for the first time. 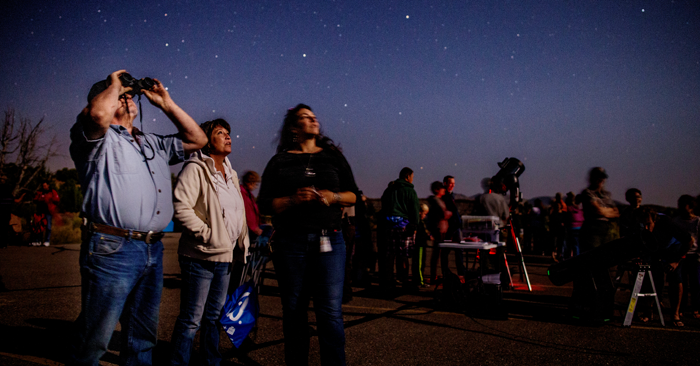 Dark Sky programs attract as many as 200 participants and include star parties, full moon hikes, and nighttime ‘scorpion safari’ and ‘owl prowl’ events.